Wild Bill's is a brand of Wild Bill's Foods, Inc., based out of Lancaster, PA. The company has been around since 1955, starting out as "Balwell's Butcher Shop". Balwell's started offering meat snacks in 1983. By 1988, the company changed its name to Wild Bill's Foods, Inc. In 1997, Wild Bill's was acquired by Clemens Family Corporation, which owns several companies in the business of meat processing, storage, and delivery, helping Wild Bill's reach greater distribution and production. Today, it's owned by Monogram Food Solutions, makers of several major jerky brands. The brand currently offers several lines of jerky, including a Premium line, as well as Tender Tips, and shredded jerky. What I'm reviewing here is from their "Tender Tips" line. Beef, soy sauce, seasoning (garlic, pepper, red pepper). (Sprayed with potassium sorbate solution to help protect quality). The first thing I taste from the surface of these pieces is a strong soy sauce flavor, along with a fair amount of saltiness. Overall, the surface flavor has a moderate amount of flavor intensity. In the chewing, I taste more of the soy sauce with a greater saltiness. Here and there I can pick up a trace of black pepper, and I can detect a faint garlic flavor. For being advertised as a Hickory Smoked variety, it's hard to notice the smokiness. I think the stronger soy sauce flavor washes that flavor out. And in fact, soy sauce is the primary flavor of this jerky. It's well noticed all the way from the moment I put a piece into my mouth, to when I chew it up and swallow it down. The soy sauce tastes similar to the chinese-style. 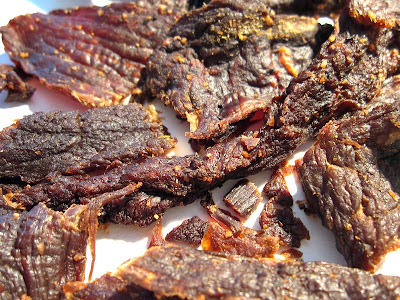 With the soy sauce comes a saltiness, and this jerky tastes quite salty. Just on an individual piece basis, there's quite a bit of saltiness, but still tolerable for my tastes. But after eating several pieces, it builds up a scorching that tends to wear me out. Despite the red pepper noted in the ingredients, I don't feel any kind of burn or heat from this. And after eating several pieces the garlic remains very light. Overall, what you're going to get out of this jerky is a lot of soy sauce flavor, lot of saltiness, and no noticeable smokiness. That's about it. 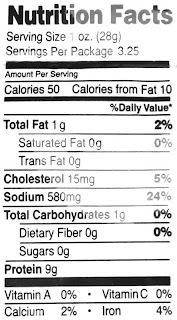 These appear to be slices of whole meat, sliced to a medium thickness, and in small to medium sized strips. This is a dry jerky, having little flexibility before cracking open. Tearing pieces apart with my fingers is largely easy. Chewing, however, varies with some pieces being semi-tough, and others rather easy. The chewing texture starts out feeling dry and rough, with some pieces breaking apart easily with light biting, but others requiring some good chewing. Once chewed down to a soft mass, they typically have a steak-like texture, very much like one cooked well-done. The tougher pieces however, seem to feel more crumbly, and less steak-like. This jerky appears to be quite lean, with no visible chunks of fat. I did encounter a few pieces with sizeable streaks of gristle, but they didn't seem to get in the way of chewing all that much. Otherwise, this meat doesn't seem to provide any unchewable wads of tissue. It's also clean eating for the most part. My fingers don't pick up any residue, and there seems to be minimal fragments of meat flying off as I tear pieces apart. Wild Bill's sells this Hickory Smoked variety from its website at a price of $5.25 for a 3.25oz package. I bought two packages, each a different flavor. Add to that shipping costs of $6.50, and it came out to a price of $17.00. That's a per ounce price of $2.62. For general jerky snacking purposes, at the $2.62 price per ounce, this seems to provide a weak value. I'm getting just a little bit of snackability from this, largely because the saltiness is rather strong, and the flavor is rather simple. Meanwhile, the $2.62 price per ounce is quite high compared to many other jerky brands. I just don't get an equal amount of snackability in return. If you can find this in a store where you don't have to pay shipping, it might earn a "fair" value. As a Hickory Smoked variety, at the same $2.62 price per ounce, it's a poor value. I don't really pick up any smokiness from this. The strong soy sauce flavor and its strong saltiness, seems to shut out all the other flavors. If you bought this online like I did, thinking you're going to get some good smokiness, I don't think you'll realize any return value. This Hickory Smoked variety from Wild Bill's Beef Jerky just couldn't provide me much snackability, largely because the salt intensity is quite high, and the flavor is rather one-dimensional, being largely soy sauce. And while this jerky may have been hickory smoked, I just don't find much smokiness in this. Overall, it's easy to eat though some pieces seem to be out of place being rather tough. And despite a few pieces containing gristle, overall this jerky provides a good chewing texture. But it's hard to consider that chewing texture when the salt intensity is this high, and the overall taste is relegated to one flavor. I just don't feel encouraged to keep eating, though the flavor is still tolerable to keep it at a "fair" rating. My recommended beer pairing for this, is to go with a stout. wild bills jerky is quite repulsive.. unless u enjoy eatting mostly salt. two thumbs down from me.. id u like quality jerky.. pemmican is the way to go. what a fkn waste of 5 bucks.. wild bills is nasty.. dont waste ur money. the tender tips are far better than this jerky, although this is the best locally available. far better than oberto, jack links, etc. i'll concede that it is quite salty. Wild Bills is the best. Salt = good. the bad stuff tends to feel like plastic. Judging by your pictures, it looks like you got the bad batch. I live in Northeast PA which is a decent drive from Lancaster, and I had to figure out how to tell which is which before buying. You need to review Wild Bill's again. You got an older package...dried up. I used to do Sales Training for a 9 store video chain in PA. We'd buy this by the pound in 10" long pieces, sold from a jar. The stuff was incredible, both in taste and sales. Each store would go through several pounds a week at .99 cents a piece (about 25 to a pound). We'd also order the "tips"... the pieces not long enough to sell in the jars. I'd personally go through a pound a week. I did get a few bags that had dried out but 90% were tender and flavorful, like no other jerky. The BEST by far. Try again! yeah, I know I'm a little biased, but I'm from northeast PA, and it's a given that this is THE beef jerky to eat while getting your drunk on at the local dive bar, watching football or when you want a quick but satisfying snack. I've NEVER in my memory had a bad piece, probably since it doesn't sit in jars/on shelves for very long in these parts. for what it's worth, this is my favorite. Five stars. i dont care what anyone says, this is the best jerky ive ever had. This is by far the best jerky that I have had locally. It is salty but thats what I like (eat kikkoman soy sauce out of my palm) and I find the others such as pemmican and jack links disgusting. The only other meat snack I eat is Franks red hot chile and lime steak strips, but if you prefer the dry texture and soy sauce flavoring like I do Wild Bills will probally become your favorite as well. I have eaten hundreds of different brands from literally all over the world and Wild Bill's is hands down the best. How can this guy give Wild Bill's such a "fair" rating? This jerky is by far above and beyond all that other crap you find at the stores...jack links, oberto, pemmican. How can nick say this is repulsive and say pemmican cardboard is the best? Must not be a real jerky eater. This is the best jerky I have had. It is the only kind that I have that is of a dry style. I have tried others and when I compare, I just think he others are processed meat. Yes it dies het salty if u eat a lot it. I agree. I just had some and I could swear all I had was a shot of soy sauce...don't recall any meat flavor in the entire bag. thumbs down for sure. I have had MUCH better jerky from both national chains and local mom-and-pop brands. you haters are nuts... this is the best ive ever had, definitely deserves a better review, give it a second shot man! My memory of eating this jerky is a bad one. I recall stiff pieces of "meat" doused in soy sauce. I put this in the dog treat category. Really, really bad. Wild Bill's is the best jerky I've ever had by far. I always keep an eye out for places that sell it and I'm not afraid to go out of the way for it if I'm having a hankering. I love Wild Bill's tougher texture and saltiness. It's like at some point someone decided that all beef jerky should be mush. I used to be able to eat pemmican, oberto, etc. before I discovered Wild Bill's but now that stuff just grosses me out. It's funny that everyone's saying to re-do the review because he got an old, dry bag. When I'm buying it I'm looking for the older, dryer bag. I agree with most people here, Wild Bill's is the BEST jerky I've ever had. I think the saltiness issue has gone away. I just recently bought the 15oz jumbo pack of tender tips and I think they changed the recipe a bit. It's even better now, less salt. It was always a treat to have since they don't stock it in many places in NJ but now I order it online. It's truly better than anything on the shelves but I do wish they had more variety when it comes to flavors, maybe something spicy. Coming from a SERIOUS beef jerky connoiseur.... Wild Bill's beef jerky is BY FAR the BEST JERKY I HAVE EVER HAD. I spend the last twenty yearsof my life searching high and low for this stuff, buying it in every gas station I seen it! When I am out of this stuff... I seriously crave it!! No... if you are wondering, I do not have a salt addiction. It is just that this stuff seriously hits the spot!! 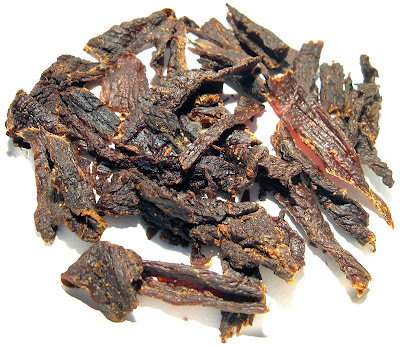 It is the epitome of what a jerky should be..... dry, chewy, salty. I have tried literally several hundred different brands, but always come back to good old Wild Bill's!! Just goes to show reviews like this are largely based on one persons tastes, and peoples tastes are as varied as the colors of a rainbow. The majority of the comments here bear out my own opinion of Wild Bill's... it's good stuff, some of the best I've ever tried, and I'm a jerky hound. Anybody that prefers the cardboard taste of Pemmican over WB's must have nerve damage to their taste buds, that's all I can say. Two thumbs up for Wild Bill's. 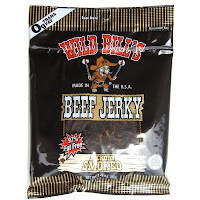 I absolutely love Wild Bill's beef jerkey. Nothing compares to it. Nothing! Yes its a little salty, but my taste buds like that. I look for it everywhere. When I see it I buy it. Hands down it's the best! I love this jerky. Very delicious and Very "dry", the way I like it. I want to chew my jerky! Also the sodium content helps with electrolytes if hiking or camping. Negative comments are from city folks. Maybe the company has bad quality consistency. The package I had was way TOO SALTY, almost inedible. If it was less salty I can imagine it tasting good. You can buy this jerky online from their website, much better than going to gas stations and paying a premium. Wild Bill’s is definitely one of the best jerky’s out there, it’s salty but great, just have it in small amounts if you’re worried about the sodium.